copyright 2002, 1979 Margaret L. Benner All rights reserved. In order to understand pronoun – antecedent agreement, you must first understand pronouns. A pronoun is a word used to stand for (or take the place of) a noun. 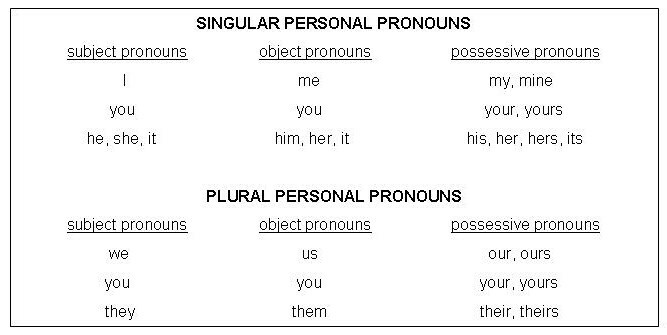 Below are the personal pronouns. They are called “personal” because they usually refer to persons (except for it, which refers to things). There are two nouns in this sentence: John and man. Either of these nouns can be replaced by a pronoun. If we replace John (the subject of the sentence) with a pronoun, we choose he, a subject pronoun. If we replace man (the object in the sentence) with a pronoun, we choose him, an object pronoun. Rewrite the following sentence in the space provided, first replacing the subject noun Laura with a subject pronoun; then replacing the object noun Amy with an object pronoun. 1. A pronoun takes the place of a noun. a) A subject pronoun must replace a subject noun. An object pronoun must replace an object noun. b) A feminine pronoun must replace a feminine noun. A masculine pronoun must replace a masculine noun. c) A singular pronoun must replace a singular noun. We must replace the singular, masculine subject noun, John, with the singular, masculine subject pronoun, He. We can replace the singular, feminine object noun, woman, with singular, feminine object pronoun, her. Here is another problem for you to solve. Three words describe the properties of of the pronoun he. Select the correct ones, then click on "submit" and check your answers. A pronoun can also refer to an earlier noun or pronoun in the sentence. The pronoun his refers to President Lincoln. Look at the examples below to see how to choose the right pronoun for two antecedents joined by and, or, or nor. NOTE: The plural pronoun their replaces both masculine and feminine nouns. If both noun antecedents joined by and are plural, then the referent pronoun will also be PLURAL. 2. When two or more noun antecedents are joined by or or nor, choose a pronoun referent to agree with the antecedent CLOSEST TO THE VERB. In the above examples, C and D are the most difficult because the antecedents have both a singular and a plural noun. Remember these two guidelines . . .
1. For antecedents joined by and – always choose a plural referent pronoun. 2. For antecedents joined by or or nor – choose a referent pronoun to agree with the antecedent closest to the verb. Some nouns which name groups can be either singular or plural, depending upon their meaning in individual sentences. Because they can describe either the group as a SINGLE ENTITY (only one – singular) or the INDIVIDUALS in the group (more than one – plural), these nouns pose special problems as antecedents. However, the following guidelines can help us decide which referent pronoun agrees with such noun antecedents. First, if we refer to the group as a whole, and therefore, as a single unit, we consider the noun as a singular. In this case, we use a singular referent pronoun. On the other hand, if we are actually referring to the individuals with the group, then we consider the noun plural. In this case, we use a plural referent pronoun. Here, each member of the class is considered separately. The students in the class will each hand in a report. Of course, we can make group nouns plural as well, usually by adding an s.
When used in the plural form, a group noun means more than one group. It naturally takes a plural referent pronoun. 1. Group nouns considered as single units take singular referent pronouns. 2. Group nouns which consider the members as individuals in the group take plural referent pronouns. 3. Plural group nouns meaning two or more groups take plural referent pronouns. Sometimes a personal pronoun may be an antecedent. In this sentence, he is the antecedent for the referent pronoun his. His is both masculine and singular to agree with the masculine, singular antecedent he. In the following sentence, she is the antecedent for the referent pronoun her. Her is both feminine and singular to agree with the feminine, singular antecedent she. In this sentence, I is the antecedent for the referent pronoun, my. My is singular to agree with the singular antecedent, I. A referent pronoun agrees with its personal pronoun antecedent. **You may want to look back at the chart of personal pronouns to see which referents agree with which antecedents. Indefinite pronouns as antecedents also pose a special problem. Some indefinite pronouns seem as if they should be plural when really they are singular. 1. As antecedents, the indefinite pronouns below ALWAYS take a singular pronoun referent. Look at them closely. 2. 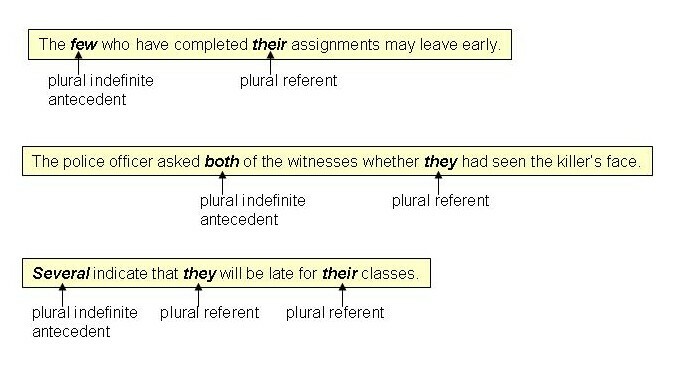 The following indefinite pronouns ALWAYS take plural pronoun referents. 3. However, the following indefinite pronoun antecedents may be either singular or plural, depending upon how they are used in a sentence. Generally speaking, if one of these indefinite pronouns is used to designate something that CAN be counted, then the pronoun is plural. 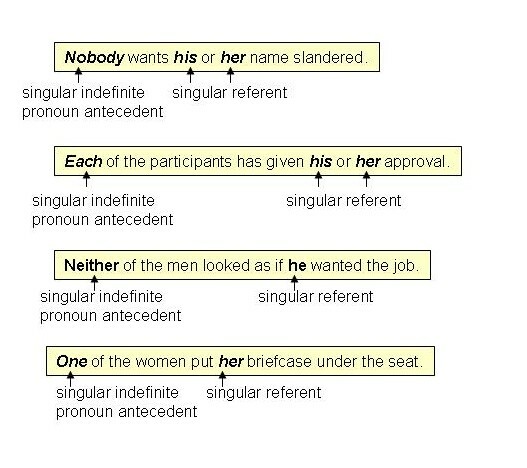 If one of these indefinite pronouns is used to designate something that CANNOT be counted, then the pronoun is singular. In the above sentence, all designates the voters. Voters can be counted (1 voter, 2 voters, etc.). Therefore, the plural pronoun their is the correct referent for all. In the above sentence, all designates sugar. Sugar cannot be counted (1 sugar, 2 sugars). Therefore, the singular pronoun, its, is the correct referent for all. In the above sentence, all designates some unnamed people (e.g. campers, ranchers). Campers, ranchers – people – CAN be counted. Therefore, the plural pronoun their is the correct referent for all. You have now reached the end of this unit. If you are doing this module on your own time, you have completed the learning unit on avoiding problems with pronoun - antecedent agreement. If you are doing this module as part of your classroom assignment, proceed to the Post Test and follow the directions you find there.